Contributors: Debie LeBeau, Bertha Z Osei-Hwedie, David Sebudubudu, Wiseman Chijere Chirwa, Gilles Cistac, Joseph Topangu, Victor Shale, L Amédée Darga, Denis Kadima, Roukaya Kasenally, Claude Kabemba. Key terms: Multiparty Democracy, Elections, Namibia, Botswana, 2004, Malawi, Challenge, Democracy, Justice, Electoral, Disputes, Mozambique, Post-Election, Prospects, Burundi, 2005, Lesotho, Local, Development, Governance, Electoral, Reform, Mauritius, Formation, Collapse, Revival,Political, Party, Coalitions, Mauritius, Ethnic, Logic, Calculation, Transitional, DRC, Role, Key, Stakeholders, Review, State of the Nation South Africa 2004-2005, John Daniel, Roger Southall, Jessica Lutchman. ABSTRACT: This paper examines the most recent round of elections in Namibia - those held in 2004. For those elections the Electoral Commission of Namibia (ECN) succeeded in reregistering almost one million voters, conducting by-elections, administering local, regional, national and presidential elections, as well as providing voter education at national and grassroots community levels. Of course the ECN did not complete these endeavours alone: the democratic process in Namibia is a cooperative (and sometimes competitive) effort between government, donors, non-governmental organisations (NGOs), civil society and political parties. In 2004 11 political parties were registered with the ECN - a high number for a country with only 977 742 registered voters. The major issues in the 2004 election were economic growth, poverty, unemployment, land reform, agriculture, infrastructure, the eradication of corruption, education, health care, social welfare, gender equality, good governance, moral values and HIV/AIDS. With all parties focusing on the same issues and in the absence of viable policy alternatives, ethnicity, liberation struggle credentials and individual personalities within and between parties play a role in voting decisions. Botswana's 2004 Elections: Free and Fair? ABSTRACT: The paper analyses the freeness and fairness of Botswana's 2004 elections. It argues that although Botswana's multiparty democracy has lasted longer than any other in Africa its elections are free but not very fair. The fairness of Botswana's elections has been an issue of controversy that has led to calls from the opposition for political reform. The problem lies in the fact that the election system, the electoral body and the political field work to the advantage of the party in power. The paper concludes that until these issues are addressed, the fairness of Botswana's elections will remain problematic. ABSTRACT: There is a growing academic interest in the connection between elections and democratic governance in Southern Africa, and Africa as a whole (see, for example, Asmal and De Ville 1994; Hyden 1997; Harris and Reilly 1998; Brito 2003; Darga 2004; Makoa 2004 and 2005; Matlosa 2003a, 2003b, and 2005). 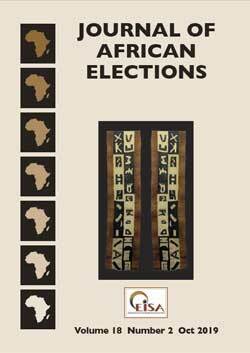 Scholars agree unanimously that regular elections are an important measure of democratic governance, though they do not necessarily constitute democracy per se (see Nzongola-Ntalaja 1997).1 Periodic elections directly shape the nature of political representation by determining which groups and parties are included in political decision-making structures and institutions, and which are not. 2 They are a means of popular intervention and participation in the political process, hence they contribute to the entrenchment of democracy (Makoa 2005), while, at the same time, influencing �fair' or �unfair' representation of political groups in representative bodies. Elections are a key mechanism through which the public can influence the political process and keep public office holders in regular and periodic check. They provide opportunities for the electorate to make a retrospective assessment of government's (as well as the opposition's) performance, and exercise some degree of control over their representatives (Dulani 2005). The holding of periodic elections therefore provides a link between democratic politics and the public interest by ensuring that politicians, who claim to represent and speak for the public, are ultimately judged by the same public (Schumpeter 1942). However, it must be emphasised that elections, on their own, do not constitute democracy. They are simply among the major hallmarks of democratic politics (Przeworski et al 1996). Reducing democracy to elections would amount to what Larry Diamond (1996) calls the �fallacy of electoralism'. This paper discusses elections and democratic governance in Malawi. It joins Robin Luckham and others (2003) who argue that although there have been numerous benefits of democratic transition there are, at the same time, some major �democratic deficits' (see also Matlosa 2005). The paper argues that one of these deficits relates to the management of the electoral process, and others to the effects of the electoral event on democratic governance. The Malawi case is an example of these deficits. ABSTRACT: A doctrinal practical study of the Mozambican electoral dispute procedure reveals some specific characteristics. Firstly, there is no precise correspondence between the procedure and electoral jurisdiction; what characterises the Mozambican electoral dispute procedure is the diversity of the procedures within the electoral process. Secondly, the dispute procedures are integrated because they cover pre-election and post-election disputes simultaneously. Thirdly, the structure is that of administrative dispute procedure. Finally, the authority of the electoral judge is an aggregate of both the control of the regularity of electoral procedures and the control of the veracity of the elections. Delicate questions, such as the scope of the powers of the Constitutional Council, the confirmation or not of the �principle of sua sponte examination or evidentiary inquiry' and the position of the Constitutional Council in relation to the correction of the election results are still unresolved. ABSTRACT: Burundi has now held three elections in a bid to end the Transitional Government that has been ruling the country since 2002 following the signing of the Arusha Peace Agreement. It was not an easy task to hold elections in a war-torn country where no population census has been undertaken for decades and where scores of citizens do not have identity books. There was considerable uncertainty about how political parties would respond to the outcome of the elections since many of then had entered politics only a few months before and do not have a democratic culture. The success of the constitutional referendum on February 28 was put down to a lack of interest, with attention focused on the communal and legislative elections which were still to come. While the former was marked by some violence and contestation, the latter appeared even more challenging. Surprisingly, the legislative election went smoothly and now Burundi is poised to achieve a return to peace and stability. Yet there are problems the country has to tackle if peace is to last and national reconciliation become a reality. ABSTRACT: In April 2005 Lesotho held its first democratic local government elections since attaining political independence from Britain in 1966. Thus, over the past four decades, the country has used various unelected interim structures to carry out development activities countrywide; structures which were not built on democratic foundations. Consequently there are, understandably, high expectations for the new local government structures put in place through the April election. The Ministry of Local Government, charged with the responsibility for implementing local government in Lesotho, worked jointly with the Independent Electoral Commission (IEC) to manage and administer the elections. Both worked in earnest to take care of the logistical arrangements throughout all the stages of the election: pre-election, polling and post-election. One component of the vigorous debate that marked the election revolved around the fact that a proportion of the electoral divisions was reserved for women only, with a view to enhancing gender equality in the decision making and development processes. Controversial as it proved to be from a legal point of view, politically this is a progressive step that conforms with the purpose of developmental local government, which is that of service delivery through active participation by all sectors of the community. This paper looks at the Lesotho local government elections and their implications for development and governance. The paper expresses the view that elections are not an occasion but part of the process towards sustainable development and democratic consolidation. Elections are, therefore, not an end in themselves but a means to an end: that end being development and governance. ABSTRACT: This paper confirms the reputation of Mauritius as a stable country with a well entrenched multiparty democracy and parliamentary system, which, however, need deepening. Independent institutions as well as fair, transparent and credible election management processes ensure trust both internally and from external observers in Mauritian democracy and the credibility of the parliamentary and executive selection process. However, the paper also brings to light the shortcomings, acknowledged by the Mauritian stakeholders themselves, of the electoral system which, while it can claim to have provided adequate comfort to the country's pluriethnic society and to have ensured the stability of the governance system is deficient in promoting adequate gender representation and a fairer distribution of parliamentary representation consonant with the voters' will. The attempt to reform the system is explained as are the reasons why the reform process is still incomplete. ABSTRACT: Very few observers, either inside or outside the Democratic Republic of Congo (DRC), thought that when Joseph Kabila took over from his slain father he would, within a few years, mobilise the Congolese in a negotiation process that would create the best chance for peace and democracy in the country's history. Political negotiation, which began in Lusaka in 1999 and was successfully concluded in South Africa in 2003 under the leadership of South African President Thabo Mbeki, blew gales of change into the DRC with major consequences for the country. The negotiation process has brought former belligerents together in a government of national unity and created a Parliament that has drafted and adopted the Constitution of the 3rd Republic. The country is now ready for its third democratic election in 44 years. But serious challenges remain before an election can be organised and bring sustainable peace to the country.